There’s now a public beta of Default Folder X 4.0.1. You can download it, as well as see the full list of changes it incorporates, on the Beta Testing Page. In short, it’s faster, more stable, more convenient, and delivers the user interface changes that you’ve been asking for in your emails. The previews are also created much faster, and with much less overhead. This is especially pronounced on Tiger, where DFX doesn’t have QuickLook at its disposal and has to generate previews with QuickTime, WebKit, and regular text rendering. If you have any performance or stability complaints about version 4.0, please grab this build, give it a try, and fire off an email if you still have issues. A great review of DFX 4 at PlanetQuark.com, complete with a laundry list of features. Folks seem to either love or hate the new UI (these guys are on the “love” side, I think). Which brings me to my next post…. Yeah – all that 🙂 But seriously, the article very nicely encapsulates some of the features that really make DFX useful in many people’s everyday workflow. It’s a good read if you’re wondering why you should buy Default Folder X. Default Folder X 4.0 made it out into the world, as most of you already know. The reception has been overwhelmingly positive, and I’ve really enjoyed hearing from so many of you. Keep those comments and suggestions coming! Chuck Joiner over at MacVoices sat down for an audio chat with me. We talked about DFX, of course, but also the history of St. Clair Software and my approach to writing software. 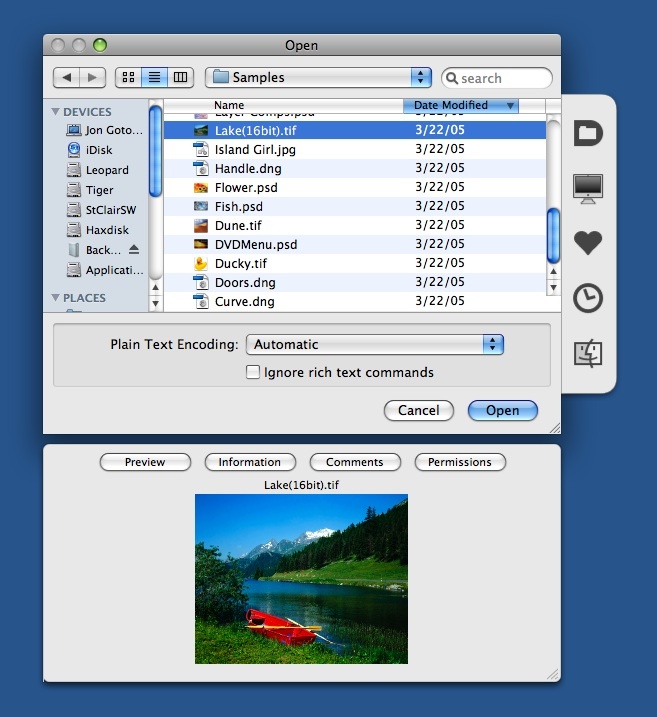 Matt Neuberg of TidBITS authored a great article about Default Folder X that talks about its features and the history and evolution of Open and Save dialogs. Regardless of whether you read this particular article, I recommend that you follow TidBITS – it’s a great source of insight, reviews, and commentary by Adam Engst and his very knowledgeable staff. Gene Steinberg of Mac Night Owl fame talked with me on his Tech Night Owl LIVE show about Default Folder X, Leopard, and interesting Mac tidbits and tech stuff. “Make Save dialogs automatically default to the current document’s folder” now works correctly with Photoshop. Rebound now correctly activates the automatically selected file so that keyboard navigation works without requiring a click in the Open dialog. Updated the DFX application in the Extras folder to be a universal binary. Fixed a problem with the path menu in Open and Save dialogs – in some cases, the hierarchical menus would not work. They do now. Fixed the installer so it automatically takes care of the “quarantine” feature in Leopard so you don’t see the “You downloaded this application from the Internet. Are you sure you want to run it?” warning over and over. Fixed handling of recursive Navigation Services calls so Default Folder X will work in very old Carbon applications like FileMaker Pro 5. Fixed menu fonts so that menus are always the right size when you turn on the “small menu fonts” option in the secret settings dialog. Only show Finder and Path Finder windows when the Finder or Path Finder isn’t hidden. UI changes. Yes, I’ve heard those of you who’ve written to say you want less black, less translucency, and smaller UI elements. A QuickLook-like preview server for Tiger. DFX uses QuickTime to generate previews in Tiger, and that’s, shall we say, not working very well. QuickTime is too slow, uses too much memory, and crashes occasionally (if you’ve had any of these problems with DFX 4, it’s likely that QuickTime’s the root cause). So I’m moving the preview rendering into a separate process that will supply the preview images to DFX.